We had stopped early the day before and spent the night at Meston Hut so time was of the essence as it was to be a long day, particularly as this was unexplored territory for all of our party. 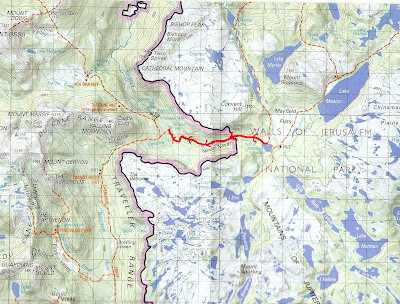 The track from Meston to Junction Lake was not very clear and we discovered that we had missed a turn and had to moss, bog and bush bash the last kilometre or so to Junction Lake Hut. Even though Colin had carefully plotted our route on our GPS’s (we had two between the 5 of us) it was still a bit tricky navigating and the terrain occassionally difficult. We (well I was anyway) were glad to reach Junction Lake Hut. On the Never Never ,crossing yet another section of boggy ground. Lots of ground water, holes and spagnum moss. The Mersey River is to the right of picture. The GPS point for the river crossing tree is S41 55.264 E146 08.980 (all care , no responsibility my friends).Next time we go through the Never Never, we will keep well north of the Mersey River i.e. to the right of the valley, closer to Convent Hill. This looked looked a LOT DRYER and with less dense tea tree. We will then use the GPS waypoint to cut straight across to the log (hopefully it will still be there) and save about 1-2 hours of bushbashing and very wet feet! Once across the Mersey River it was a simple matter of following the river downstream , past McCoy Falls to Hartnett Falls. Well, unfortunately, it was not THAT simple a matter. The tracks here vary from wonderful (see picture below) to non existant or basically animal pads that go UNDER the tea tree. Bush bashing was at the fore again and we finally made the Hartnett Falls track. Some really nice track along the Mersey River heading towards Hartnet Falls. None of us stopped in the tea tree to record the fun we were having digitally! At this point I discoved my much loved and very necessary Gortex hiking raincoat was missing from the back of my pack (where I had tucked it between the compression straps) . I was not just pissed off about losing my very expensive jacket AND my waterprooof mittens, safely zipped in its pockets. I was REALLY pissed off about having to backtrack through the mud and very thick tea tree to find it! I was also very cross with myself as I am not usually in the habit of tying gear all over my pack FOR THIS VERY REASON. Colin (my hero) and I set off , using the Track Back function on our GPS’s, and within 20 minutes had found the jacket, undamaged, just swinging in a tree. Thank you to the GPS gods. We set off back to Hartnett Falls and ,following a quick look, headed up the track to the falls / Overland Track junction to catch the others who had gone ahead. The rest of the day was a sprint to Kia Ora Hut, with a quick rest at Du Cain Hut. We walked the last 30 minutes or so as darkness started to descend on the Overland Track. We were thankful that we had been in the area before and were happy to press on , headlights dimly showing us the way. Clare, Sue and I were VERY happy to reach Kia Ora Hut about 6pm and catch up with Colin and Gary, who had arrived some time before. Surprisingly, there were about 12 others in and around the hut that night. About 6 or 8 were heading south after doing the Overland from Cradle Mountain and two other would be heading in our direction, to Pelion Hut the next day. I have read now many reports of crossing the Never Never, some good, some not so. You mention GPS waypoints for this section of your walk. Are you able to forward these? I have emailed them to you with a few other waypoints and tracks etc. WoW looks like quite an adventurous hike, glad you found your jacket back.